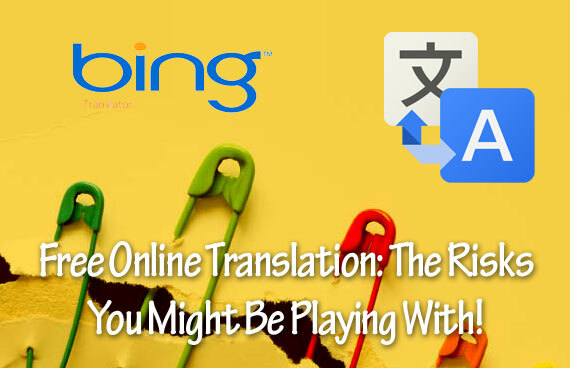 Free Online Translation: The Risks You Might Be Playing With! Nelson Mandela once very wisely remarked that when you speak with another in a language that they understand, it goes to their head, but when you talk to another in his own language, the same goes to his heart. In this growing world of commerce in which the trends of globalisation and liberalisation have a strong influence has greatly helped in broadening the sphere of economical operation. With such incessant growth of the global market and international connectivity a growing need for language translation mediums is recognised. People often rely on the free translation machines available on the internet to help them save the cost of translation or either because of the non-availability of other resources. Due to these reasons it may come as no surprise that around 200 million people used Google’s free online translation services in 2013. Many of them used it mostly for professional purposes. Due to the easy and free availability of this simple medium of translation it is only natural that people will use it to their advantage. But little do they know that the same is not free from risks. They continue to use it without thinking about the damages these tools may cause to their business. The free translation may lead to miscommunication, unintentional cultural insults and on a more drastic side; it may even result in loss of your business. A word which is recognised in your language may not be recognised in the language the word is being translated into. Also, it is important to understand that some words also have two meanings which may be completely opposite to one another and require a good understanding of the language to be able to conclude which meaning is best suited to your situation. There is also a risk of making unintentional cultural remarks which may have an innocuous meaning in one language but a derogatory and insulting meaning I the other. In such a case you may end up being guilty of damaging your business interests by emotionally hurting your co-partners, clients or colleagues. Confidentiality is the upmost priority for any business and to save you from such breach from cybercriminals and frauds, it is a safer and wise option to use professional translation services than relying on free translation services which comes with many risks hidden up its sleeves.